The problem of the purification of the water hasn't found a common solution valid for every situation of the daily practice yet. But today we are able to offer a versatile product that can find different applications in many situations. The Cullmite is our exclusive product of calcium carbonate and semicalcinated magnesium particularly suitable for acid drinkable waters or poorly mineralized ones, which has allowed us to work in successful purifying processes. The Cullmite's treatment permits a natural and spontaneous reaction of solubility, in proportion with the acidity in the water (CO2) obtaining a neutral salt (bicarbonate) that gives water a pH7, so we protect the hydraulic systems from rust and limescale. The deacidification is based on the capacity of the neutralization of the acid substances melted in the water because of the granules of Cullmite that are on the free part of the filtering surface. The efficacy of the deacidification is linked to its chemical composition (mainly CaCO3 and MgO) with the free surface and with the porosity that assumes a relevant value, being at the maximal level. 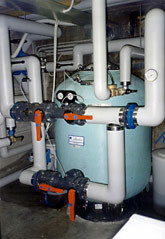 The filtering surface can be regenerated with the backwashing. This operation is made easier thanks to the negligible value of the adhesion of the polluting matters on the Cullmite's granules. so increases the hardness and the alkalinity of the treated water. From the mentioned reactions we understand that 1 gr of Cullwater neutralizes (consuming itself) 2 grs of CO2 originating an increase of hardness of 0.234 °F. The pH instead can increase til a maximal value of 9. In order to obtain a particular value of pH we have to consider some aspects as the quantity of Cullmite that we use, the time of contact, the origin pH, so the water treated must have a speed depending on these aspects. The mineralizing automatic and semi automatic Cullwater filters are vertical and work in pressure til a maximal of 7 Bars in according to the dimensions. The chosen model can be controlled by manual, electric or hydroelectric valves for a regulation of the phases of service, of backwash and washing in corrent.